It's been a while since I posted, dear friends. My day job is killer and takes up way too much of my times these days but I am grateful that I have one. 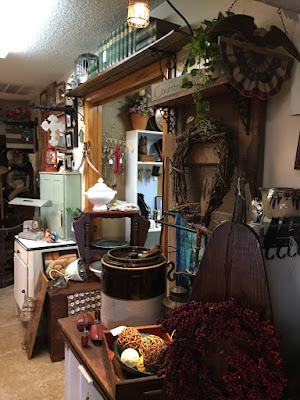 Still, I do miss road tripping and finding nifty little shops. 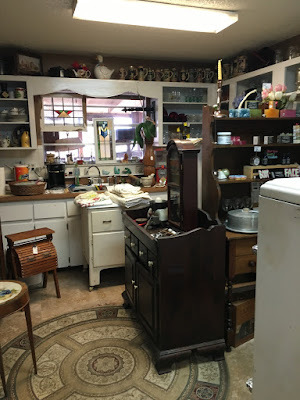 I was doing some shopping in Spring Hill/Weeki Wachee as there is a great Hobby Lobby and Marshall's in the area. As I was waiting in line to check out, I was doing a google search when a message popped up about an antiques in my area. My kind of click bait so a quick click and Black Oak Antiques shows up and it is " behind" the Marshall's. Holy gotta go there now, Batman. Sometimes the most amazing little shops are hiding in plain site. 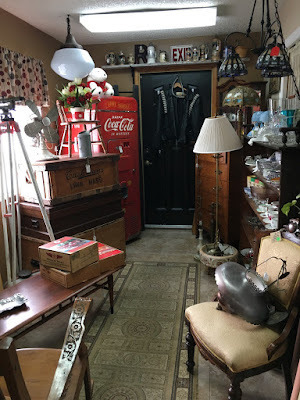 So a quick 2 minutes trip out of the shopping center and into the Black Oak Antiques parking area. 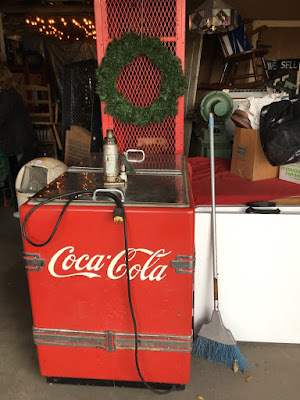 They were also having an outside yard sale with lots of treasure to be found. 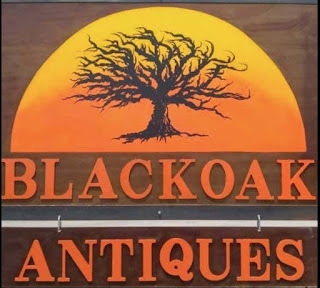 Black Oak Antiques is housed in a small home with the rooms filled to the brim with goodness. When I entered the shop, this magnificent, copper weather vane of a sperm whale greeted me. 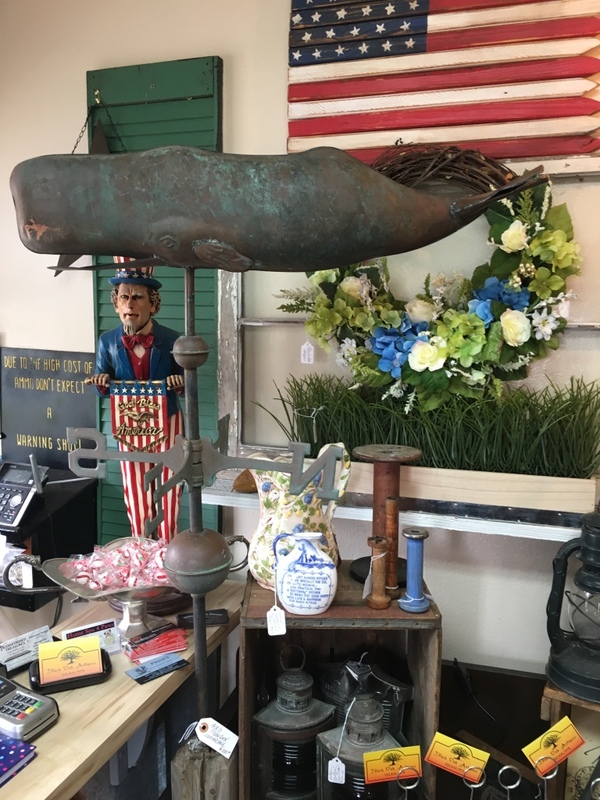 Oh, be still my heart, my favorite whale species and a weather vane. If I had been the big lottery winner last week, this beauty would have come home with me. 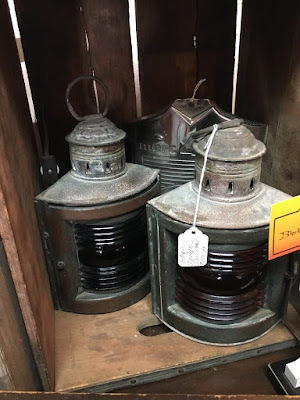 Antique nautical lighting, another passion offered here. Black Oak Antiques is an antique store in the truest sense and the rooms are filled with great vintage pieces and genuine antiques. 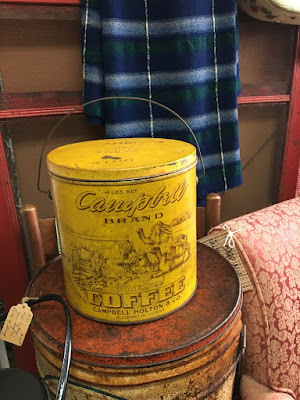 Antique crocks, treanware, and American primitives. 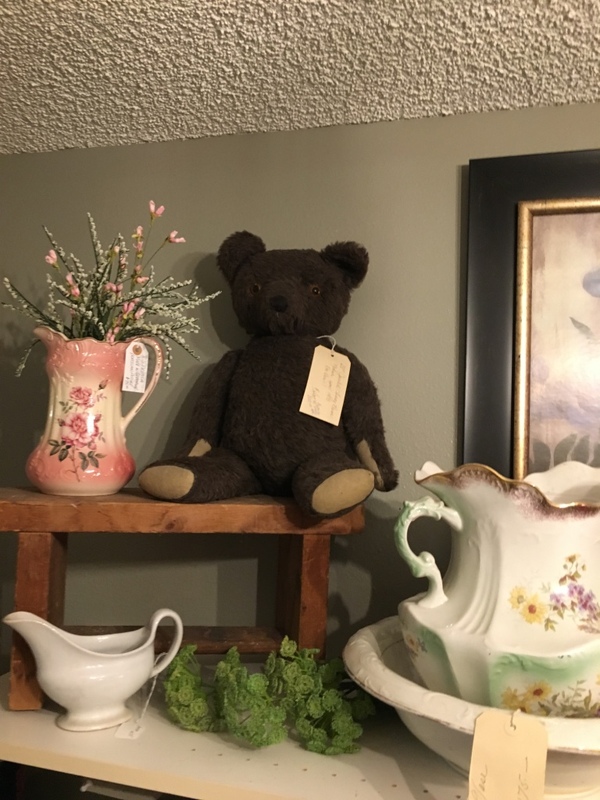 Sweet antique teddy bear nested on a vintage shelf. Gorgeous wooden fireplace mantle, oak desks and shelving units. 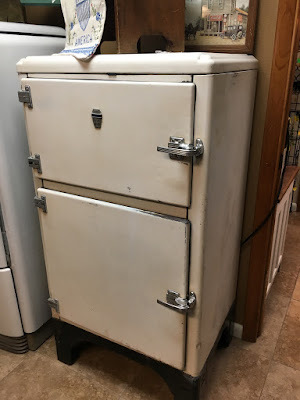 The kitchen room was filled with vintage kitchen pieces and this nice, soft pine, mid century dry sink. Not only are their "Honeymooner" type frigidaires but they also have a genuine "ice box". Stacks of wood boxes and lots of unique lighting. 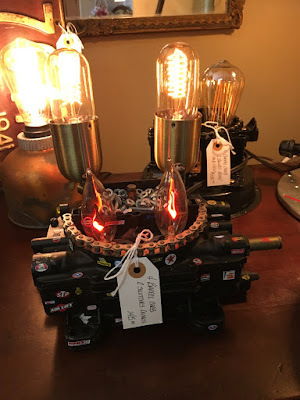 Steampunk lovers, this is one of few of the coolest lighting pieces I have seen in a long time. 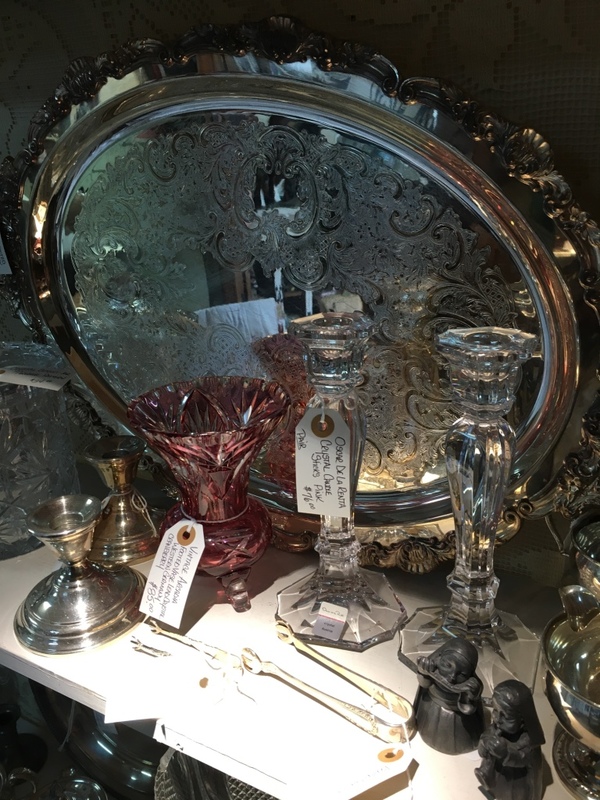 Hand crafted by an artisan, each piece is different. A hallway shelf was filled with antique and vintage glass, sterling and silverplate. Next to the house is a detached garage that is filled with rusty, crusty, chippy, painty and just cool pieces. 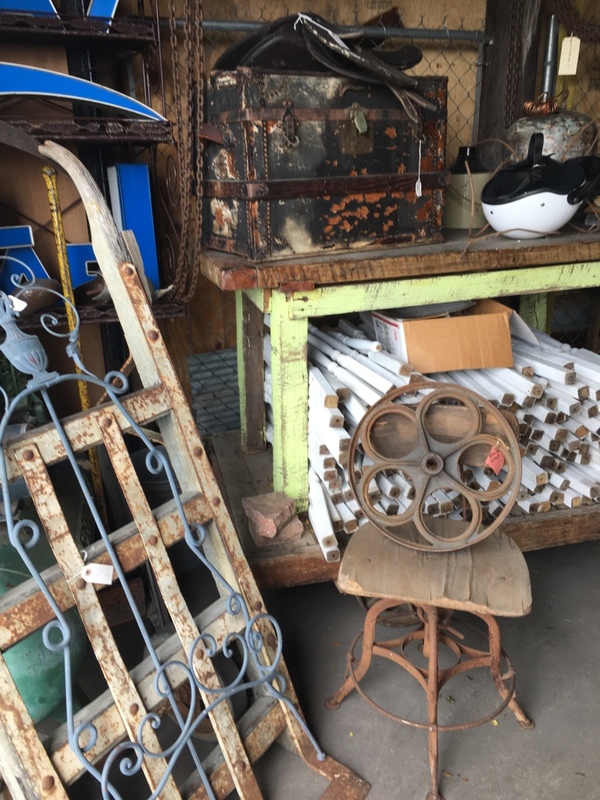 From spindles, metal bed frames, machinery and whatever, this is a place for ones creative juices to see found objects and transform them into something different. 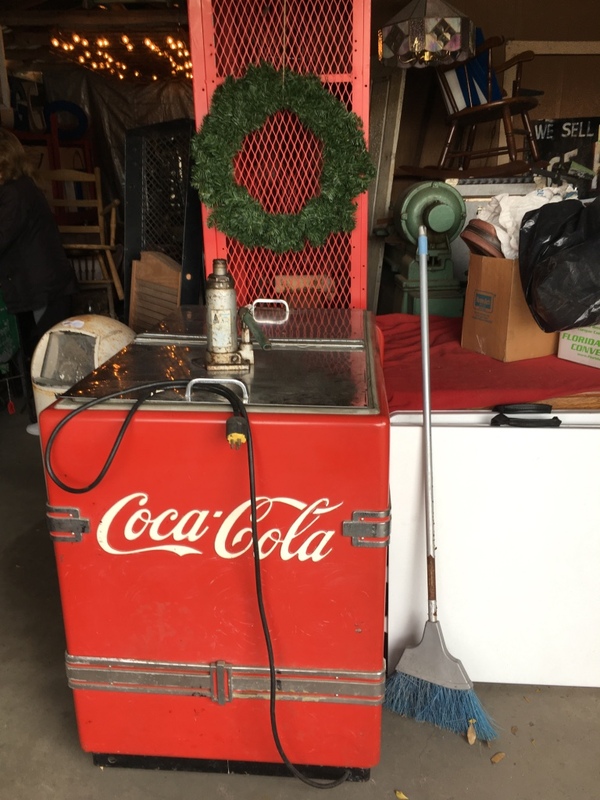 A stunning genuine coca Cola cooler in amazing condition. 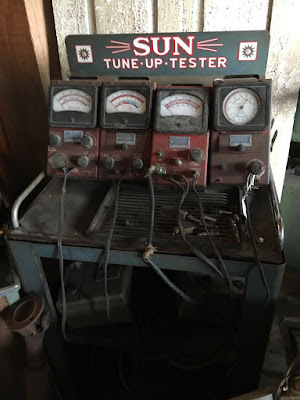 A Sun Tune up Tester with dials and cords and wouldn't this be fun to turn into sometime of lighting fixture? I am so delighted to have found this lovely antique shop and I will be back again soon. Oh, and did walk away with some treasure...a bag full of vintage tea towels and a newspaper dated January 17, 1849. Yup, pre civil war...once I carefully open it up I will snap photos and post as I love the style of language used in the articles. Wishing blessings to you and those you love. Sea Witch. Hello son you buy antiques ? 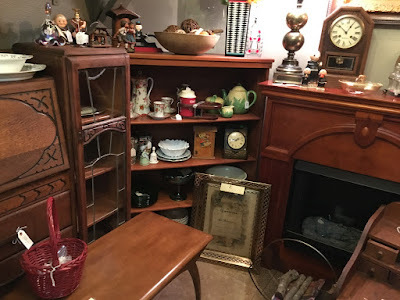 I HAVE have a French provincial hutch bookcase all white original top . Or donyoubknow pgnanyone interested ? Loves me some sidewalk sale.